You could tell Martin Keown was mad, because his brow was even more solemn and furrowed than usual: like a man trying to do a long division who had been left with an unexpected remainder. Like a grieving hound. Like someone who’s won the lottery, but has just been informed the prize will be paid out in 1p coins. “You weren’t happy with Mesut Ozil tonight,” host Jake Humphrey suggested on BT Sport. “I haven’t been happy with him for some time,” Keown snarled immediately, almost as if he had been expecting the question and planning his answer in advance. Keown’s rant – what’s known within the industry as “engaging digital content”, and outside it as “pound-shop Chris Sutton” – instantly went viral, proving one of the universal truths of the game: namely, that a game of football doesn’t really exist until someone, somewhere, has got furious about it. And beyond that, it again underlined the fact that in games of this magnitude, no failure can ever be collective, no blame shared. Someone – but only one – must always be culpable, and as Arsenal were knocked out of Europe again, guess what? It was Mesut Ozil again! It’s worth unpacking some of that, because Keown’s words go deeper than one pundit’s criticism of one player’s performance in one game. What’s being ascribed to Ozil, by contrast, is not simply a bad night at the office, but more profound, perhaps even moral failings. “Not putting a shift in” implies laziness. “Carrying him” suggests selfishness and disloyalty. “Kidding” and “conning” evoke something more sinister still: an attempt to defraud, to hoodwink, to cheat. 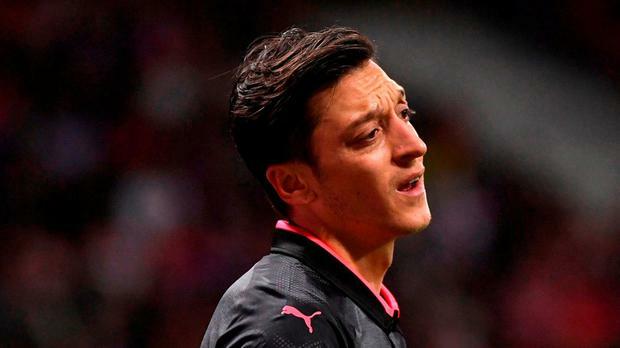 Much of the criticism of Ozil on social media mentioned his lavish wages, as if playing badly on £250,000 a week is somehow worse than playing badly on £150,000. The reason for making such a big deal about all this is that this is by no means the first time Ozil has been turned into a lightning rod after a bad game. And it was a bad game, make no mistake about that, but in this respect he was no different to half the Arsenal team – David Ospina, Hector Bellerin, Aaron Ramsey, Nacho Monreal. Ozil had very little to with Atletico’s only goal, for example, or the fusillade of chances they created either side of half-time and which really should have put Arsenal out of their misery long before the Italian referee did. And indeed, you could scarcely have picked an opponent less suited to Ozil’s unique skill-set. Atletico defend narrow and deep, with exceptional discipline and organisation, with remarkable stamina and agility, with quick reflexes and an ever-present threat on the break. They haven’t been successfully countered in La Liga all season. No team has managed to pass through them. Almost half the shots they have faced have been from outside the penalty area. Expecting Ozil to break down perhaps the world’s greatest defensive experts is a bit like using a can opener to pick a lock. Even a player as great as Ozil, after all, is only as good as the movement around him. And with Danny Welbeck running into dead ends, Ramsey preferring to come short and take the simple pass, and Alexandre Lacazette swaddled in a blanket of Atletico shirts, Ozil was too often forced to create something out of nothing. Clearly he could have done more with what he had, especially his deliveries from wide. But his detractors will surely have noted that even an indolent, perfidious, fraudulent Ozil completed more passes in the final third (42) than any other player on the pitch. Clearly, then, there’s something else going on here. And if anything, the screeching exasperation that Ozil seems to inspire is not really about the sort of player he is, so much as the sort of player he’s not. It’s easy to forget, when he was signed back in the summer of 2013, just what a fey and unbalanced squad Arsenal had: a collection of mercurial talents with flair and technical ability, but developing a reputation for flimsiness. And so into this void arrived not a world-class striker, nor an imperious midfield general, nor reinforcements in goal or central defence, but Ozil: a genius, an A-lister, but essentially a £42.5 million augmentation of what Arsenal already had. Keown’s comparison of Ozil with Patrick Vieira was particularly telling in this respect: Arsenal needed a new Vieira in 2013 much more than they needed another attacking midfielder, and as ludicrous as it sounds, you suspect that through the Flamini years, the Coquelin years and now the Xhaka years, they have never quite forgiven Ozil for not being that man. When Ozil is at his best – for example, in the North London derby earlier this season, the home wins over Manchester United and Manchester City the season before last, or numerous games against mid-table Premier League opposition – we all instinctively realise this. Ozil was never the general, the heartbeat, the talisman. Instead, he’s one of those players who slides out of view, who sands and polishes, who oils the moving parts. The trouble is, when you have no moving parts, you can very easily look redundant. And so, perhaps more than any other player, Ozil has come to embody the utopian folly of late-Wenger Arsenal: the stubbornness, the fragility, the stunted development, the almost self-defeating prioritisation of style over substance. It’s a reputation that, fairly or not, will pursue Ozil as long as Wenger is in charge. Fortunately for him, that’s not very long at all.